Chauvet, a leading manufacturer of professional lighting, announces the moving head wash luminaire Q-Wash 560Z-LED — ideal for highlighting specific areas or for flooding the stage with light due to its variable six-to-32-degree zoom. 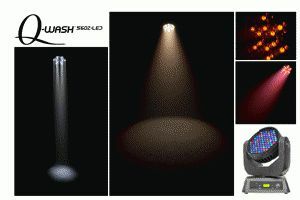 Q-Wash 560Z-LED is powered by 91 three-watt RGBWA Cree LEDs and is designed to produce massive flicker-free output, while maintaining quiet operation. Its superior color mixing provides a better spectrum of color, from the most vibrant hues to subtle pastels.Quick pan-and-tilt speed works to get the fixture into position for great effects.